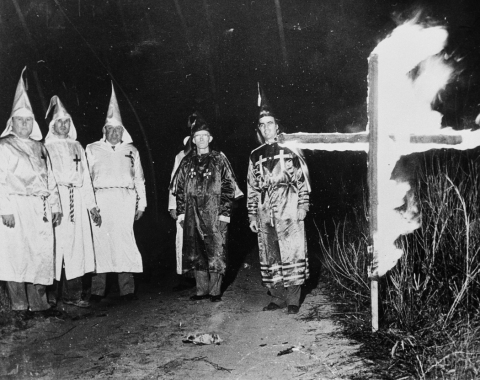 On May 28, 1965, members of the Ku Klux Klan burned crosses on the grounds of courthouses and city halls in 13 North Carolina cities and towns. Crosses were burned in places large and small across the Coastal Plain and Piedmont, including Burgaw, Currie, Elizabethtown, Henderson, Oxford, Roxboro, Salisbury, Southport, Statesville, Tarboro, Ward’s Corner, Whiteville and Wilmington. The coordinated campaign of cross burning was part of a wider wave of violence undertaken by the KKK in reaction to the growing civil rights movement that was sweeping the nation and state. Just months later, the U.S. House of Representatives’ Un-American Activities Committee found that North Carolina had the largest Klan presence of any state in the Union, with more than 6,000 members organized into at least 112 local chapters and scores more sympathizes. The Klan had even set up a booth at the State Fair. Despite the violence and tension, then Governor Terry Sanford continued to quietly lead business and other community leaders toward desegregation not by calling for changes in law, but by setting up programs like the Good Neighbor Council, which encouraged fair employment practices to improve race relations.